PRODUCT DETAILS: Wilbur Curtis Iced Tea Dispenser Remote Stand For Tco308 Tea Dispenser - Designed to Preserve Flavor - TCORS000 (Each). Stainless steel construction is built to withstand the commercial food service requirements. This tea dispenser stand is easy to carry and transport. Designed to fit perfectly with the Wilbur Curtis tea dispenser line. Durable construction makes this a valuable addition to restaurants. Contemporary, Rounded Design - ELIMINATES sharp edges and corners. This commercial tea dispenser stand is popular in fine restaurants, hotels and other food service locations. Stainless steel construction is built to withstand the commercial food service requirements. Remote stand designed to fit perfectly with the Wilbur Curtis TCO308A000 tea dispenser. Durable construction makes this a valuable addition to restaurants. Contemporary, Rounded Design - ELIMINATES sharp edges and corners. 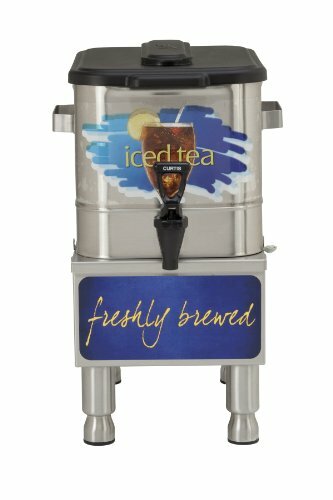 This commercial tea dispenser stand is popular in fine restaurants, hotels and other food service locations.